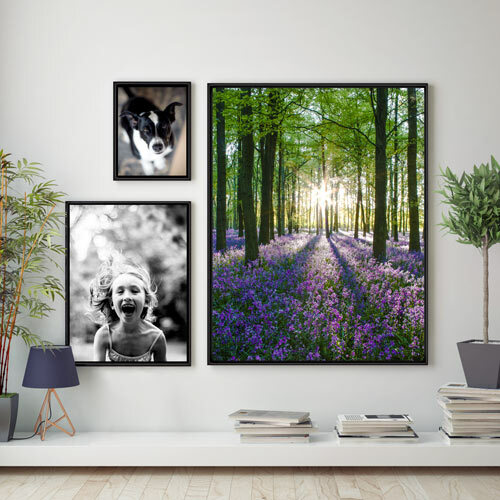 Canvas with floater frame is a simple least expensive way to get good quality photos on the wall and these metal frames are a nice way to trime your images out. They look great on the wall. The cut corners are rough and sharp you could cut yourself handling. I also had some gray dust on the sides of my black frames, but keep in mind framing typically cost 5x what your paying and i was happy with the results. Hello Mike. Thank you so much for sharing your beautiful artwork! We appreciate your feedback regarding the corners of the frames being sharp. Your feedback is vital for us to make necessary improvements. We hope to avoid this from reoccurring with our Metal Floater Frames. I have passed your feedback along to our operations team. Again, we truly value your feedback Mike! We hope you will continue to allow us to provide you with your framing needs. Happy Framing! Easy to assemble and it really made my painting look more finished. Very happy with price and ease of assembly. Made my painting look so much better. Love these floating canvas frames. Very elegant and understated. Good quality and easy assembly. I am a full time artist. I've used Picture Frames as my frame source for many years. The price is reasonable, the quality is high. The service is always fast and dependable. The one place that I could find the actual size (16" x 16") that I needed. Product arrived on time, was cut beautifully and went together simply. 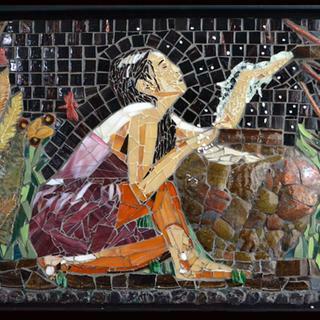 I have purchased both wool and metal frames for my mosaic wall hangings and very happy with the products and services. 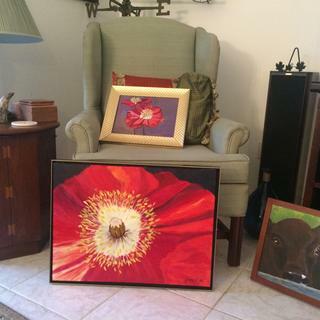 I highly recommend Pictureframes to all artists! I love the depth of the frame and the way it is spaced away from the edge of the canvas. What a stunning presentation! The art is gorgeous and the choice to add the extra moulding was a smart one! Thank you for your review and for sharing the final project! These floating frames makes all my art work have a more finished, professional look. I would definitely recommend these frames to anyone who likes a more contemporary look. They are easy to put together and the quality is excellent. Very sleek contemporary frame.Good price. It took a couple days to get through to service department with a question though. This was the perfect finish to a canvas print I bought at a home store. This frame has a nice thickness to accommodate the 1.5 inch canvas and I got a great value getting this on sale. 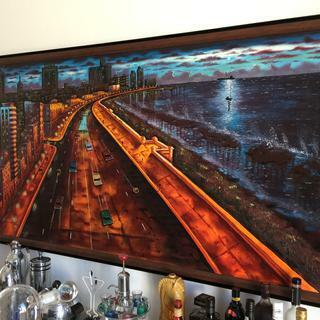 I enjoyed framing my paintings with these metal pieces, it was easy to do, just a little testy to line up the corners...outside of that the quality of your product is excellent. 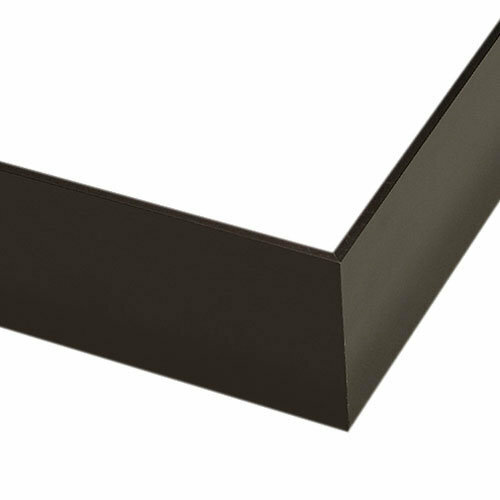 A strong frame, decent quality, but corners are not flush and show considerable light without taping to hide the gaps. Overall, the frame was solid and I was grateful that I could get a frame that size. It arrived very rapidly, packaged very well. No damage. It looks good. I had only 2 problems. First, the instructions were not for a floater frame, which this one is. I was able to figure it out. Second. The corners are not flush. That is a big problem, but because it is black, I put black tape on the corners to hide the light showing at the gaps on the corners. What you are purchasing is not a frame- it is a kit to build a frame. Glass is not included. It is difficult to use the kit to make a "floating" frame, which is what was advertised. The directions for assembly are for a mounted work and so it the kit. This frame is a floating frame meant for framing stretched canvas. It is not possible to use glass or acrylic with this frame since it is intended to have screws secure the frame to the stretcher bars. 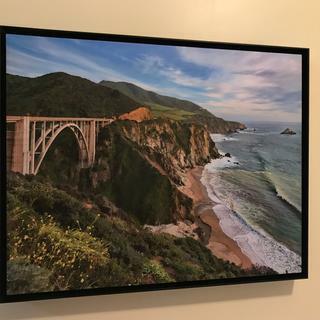 We would be happy to offer you a return on this product our photne number is 1-800-332-8884 or email CustomerCare@pictureframes.com to finalize the details. Low end solution to framing. It's a low cost option. Nice thin sightlines. But looks its price. Assembled easy. Hanging hardware screws were jammed and wouldn't turn. So I couldn't use them. It was slightly scuffed on arrival. Have to handle it carefully to not scratch. I'll definitely switch to a one of the wood versions for future needs. Hi Bob. Thank you for your feedback. We would love to hear how we can make this right for you. Please feel free to give us a call at 1-800-332-8884. We are in the office Monday-Friday 8am-7pm EST. Thank you for your business and have a great day! Ordered the metal floating canvas frames (in black and gunmetal - 718GUN 718BLK) along with two black wood floating frames. (CF5). Nice material but no matter what I tried, could not get the sharp corners of the metal frames to line up without gaps - came I assembled. The wood frames were reassembled and exceeded my expectation in term of quality and value. Highly recommend CF5 over metal 718 series. Hi Nhi, thank you for your review. We regret to hear that the 718 frames did not meet your needs, however, our customer care team has already set up the return arrangements for you. If we can be of further assistance, please let us know. We appreciate your business and hope to serve you better in the future! So far, I've only used one of the 5 i ordered and one of the corners doesn't meet. Hello Elena! Thank you for being a loyal Customer. We would like to make sure the entire order exceeds your expectations. If you would like us to email you a instructional video showing you how to assemble the frames, we will be glad to do so. Please give us a call at, 1-800-332-8884 so that we may further assist you. Thank you for your business. 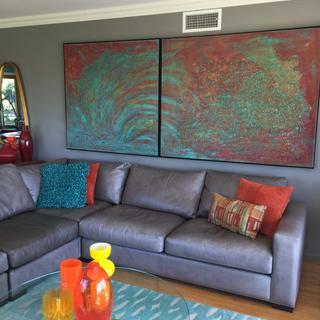 I paint abstractly in acrylics on large stretched canvases and use floater frames because they lend a professional appearance and protect the painted surfaces. These minimal edged metal frames enhance my paintings without distracting from them. Thought it would look perfect with my latest painting without overwhelming it. These frames look clean and modern and make my artwork look very professional. They are fairly quick and easy to assemble. I have this frame on 4 other pieces of art in my house. It's a very stylish frame for canvas art. Arrived quickly and was easy to assemble. Simple clean lines. Subtle yet bold. I have a painting on canvas that will look better framed and I wanted a very small floating type frame. Sleek, minimal frame for my abstract paintings. I need to frame canvas pictures, and I like the floating aspect and small width of frame so that you see the picture, and not the frame. Chose this sleek, simple frame for an abstract painting on canvas. The art work is abstract and it is going into a Museum show. I wanted to dress it up a little without interfering with the art itself. I've used this frame before and like the sleek modern style. This is a clean classic style frame that is easy to assemble and finishes my art to perfection. I like contemporary floating frames. I wanted a simple black border. This was it. It will accommodate thicker canvases than other frames. deep profile/rabbet. reasonable price. reasonable shipping fee due to unassembled. Excellent minimal frame for larger paintings without the oversized carrier charge. I wanted to add a frame to some canvas mounted photographs. I chose this frame as a modern looking way to finish and hang digitally printed and mounted panels. Easy Change out and no glass to deal with. Sizes up to 6 foot by 6 foot. I hope this will provide a nice architectural look with easy changeout of the imagery. 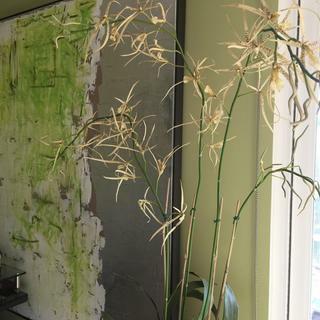 I am interested in the metal floating frame for watercolors to match a painting we already have. The frame we have now leaves 11/2” if clear frame to give the appearance of the painting suspended. Can this be done with this frame? From the pictures it looks like the artwork fills the whole frame. BEST ANSWER: In the "Additional Images" section, you will see a drawing of this frame in profile. It shows the gap that occurs between the frame and the canvas. 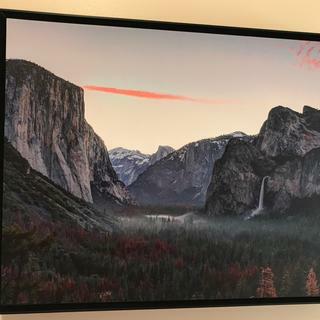 The canvas does not fill the opening in the frame and, instead, "floats" within the frame with a 1/4" gap all the way around between the canvas edge and the frame. Based on my understanding, this frame is designed for a canvas, not a work on paper. This is a nice frame - I used it for a thick canvas. Since it is a floater, I doubt that it could be used with a medium that requires glass or plexi. I know some folks varnish watercolors, and I can see that working (without glass) if you attach it to a stretched canvas. Hi Steph. 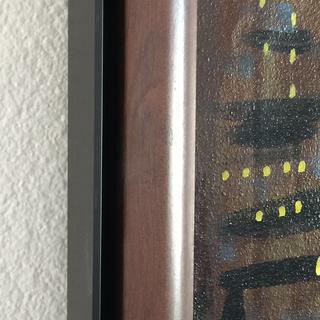 This frame has a 1/4" space between the artwork itself and the frame. This is not able to be altered. The depth of the frame is 1 1/2". Thank you! I dont think this would work for your project as it seems to only be for canvas and not any orher support medium. Can i buy just long extrusions of a plain black floater frame? 8 - 10 ft lengths in bulk. BEST ANSWER: Hello. This frame is available to be sold as 'length moulding'. Please give us a call to place this order over the phone. We can be reached at 1-800-332-8884. Thank you for your inquiry!